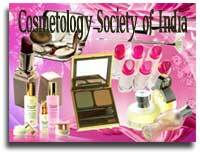 Cosmetology Society of India, Indian Cosmetic Industry, Cosmetics, Cosmetic Society in India. CDSI aims to bring science and amalgamate the concept of beauty. In this rapidly advancing field which is getting rapidly popular, it is necessary to keep a clear and rational perspective. In a field where gadgets and instruments are been introduced and updated constantly, it is necessary for people to keep track of all that is happening ever so fast. CDSI aims to bring science to the concept of beauty. The CDSI conducts Annual congress called "CosdermIndia" in various parts of India. CDSI is very much conversant with the drugs used, with the cosmetics used, the instruments and gadgets used and the procedures which are introduced and updated constantly. CDSI also tris and has been promoting a healthy interaction with the cosmetic industry by teaching them and learning from them. A healthy synergy between cosmetic dermatology and cosmetic chemistry is its approach. By all the above CDSI imparts quality and state of the art care to patients/clients in meeting with their appearance enhancing needs. In doing this CDSI have also unwittingly become guardians of the patients in protecting them and educating them against the ills of poorly equipped, unhygienic, unscientific/ pseudo-scientific beauty parlors, their equipment and their products. Members of CDSI aim at looking after the appearance enhancing needs of people in the most scientific, rational and logical manner. CDSI does this constantly updating itself with the latest advances in the field, by the means of: Constant Interaction, Symposiums, Meetings, Lectures, The Annual CDSI Conference,etc. The conference has gained immense popularity going by the increasing number of attendees from all over the country and with a sprinkling of international faculty and attendees. This has become an ideal platform to educate and be educated, to talk and to read, to think and to ponder. CDSI also brings important news and expert views through: Seminars, Workshops, International Speakers, The CDSI journal, Live demonstrations of latest procedures. All this above makes CDSI the first and the most prestigious organization fully dedicated to cosmetic dermatological needs of the Indian population and also of the international clients from all over the globe. CDSI membership is open to all qualified Dermatologists (MD, DNB, FCPS, DVD or DDV) and MBBS doctors with recognized post graduate degree in allied fields. Membership will be given at the discretion of the CDSI executive committee. Associate Members will have no voting rights and cannot be faculty for CDSI Meetings / Congress / Workshops, etc. Members can register for attending COSDERM INDIA at special rates. Avail workshop to most of the facilities in CDSI conferences at discounted rates. Eligibility for Dr Jagdish Sakhia's scholarships through CDSI. Opportunity for ISD scholarship (International society of Dermatology) scholarship. 105, Maker Bhavan 3, New Marine Lines, Mumbai, India - 400 020.